It’s a fjord within a fjord, a secluded, secret and magical place that sits above the 70th parallel in Arctic Norway, on the eastern side of the mighty Kvaenangen Fjord. It’s a place where steep snow covered slopes fall vertically to the waters edge from towering ragged peaks, before plunging down into the clearest of clear seas to provide depths in excess of 300ft within spitting distance of the adjacent shoreline. 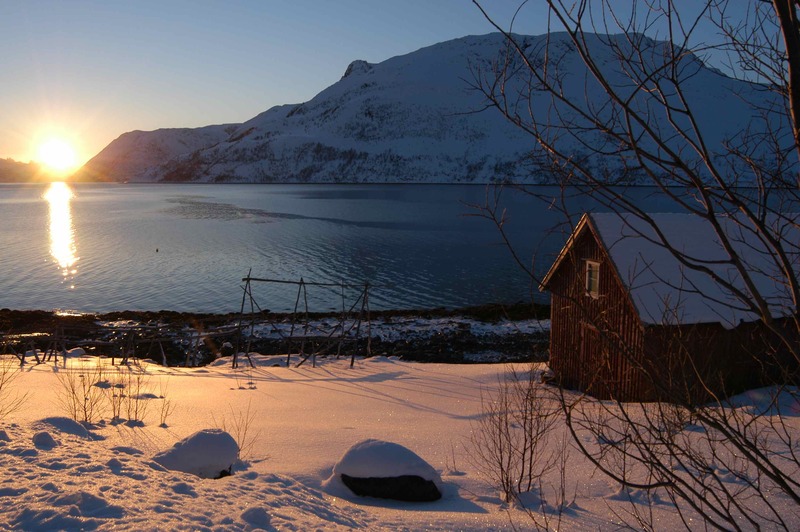 Arctic Norway during mid winter-beautiful! It’s a place where sea eagles, otters and whales hunt; on rare occasions a lone wolf has been sighted foraging on its rocky shores for scraps. It’s a place where the clear blue, compressed ice of an ancient glacier spills over the mountain tops and slides slowly towards the sea below, a place where you’ll find shoals of silver herring so thick that they cause the glassy calm surface of the water to boil. Most of all it is probably one of the best places in the world where, if you hit conditions just right, you would have a realistic chance of breaking the long standing world cod record of 98lb 12oz that was caught off New Hampshire, USA, in 1969; welcome to Jokelfjord. Each year, usually in March or April, Jokelfjord is visited by a run of very large cod, fish that have migrated here from the Barents Sea. 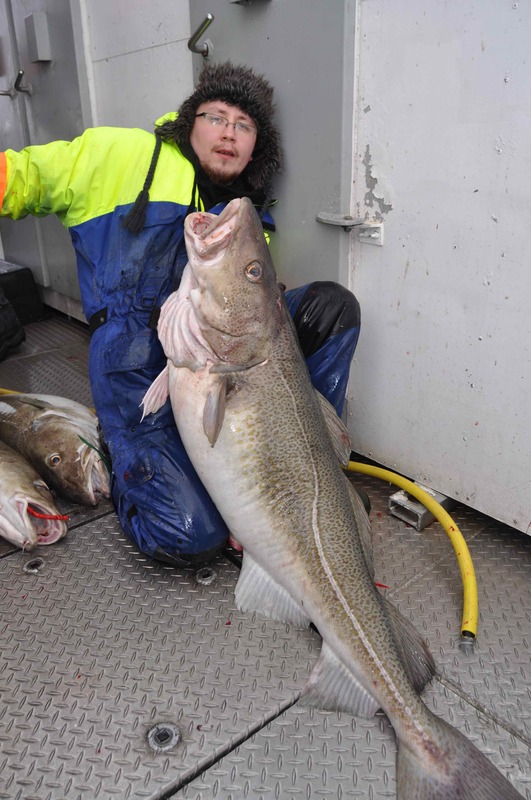 Typically these Barents Sea cod, which are referred to locally as `skrei, weigh anywhere between 20-80lb, but in recent years have included some truly monstrous individuals in excess of 100lb that have been caught here commercially. The cod come here to spawn, as the conditions within Jokelfjord are absolutely perfect with totally pure water, perfect salinity levels and an ideal sea temperature of 4.5°c. These spawning fish attract vast shoals of herring that gorge on the abundance of eggs, and these in turn attract even more cod and the whales that feast on the herring. 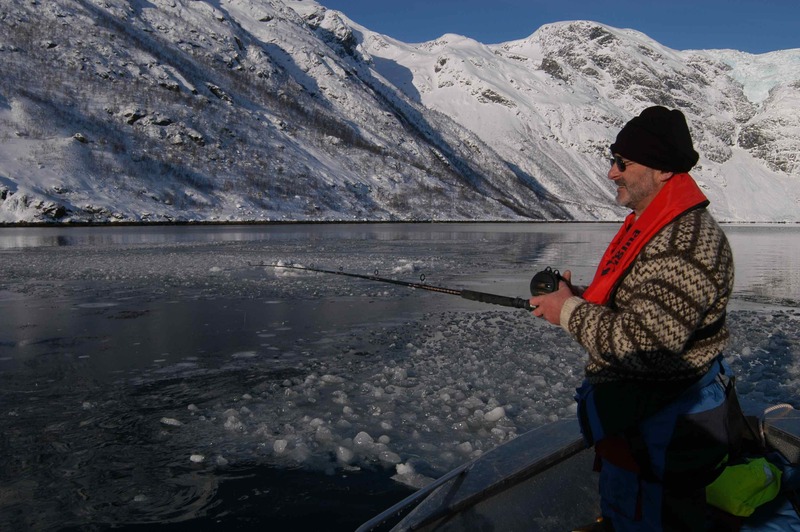 Jokelfjord is a very special place to fish. One March a group of ten fellow anglers and myself formed the first group of British anglers to test these waters. 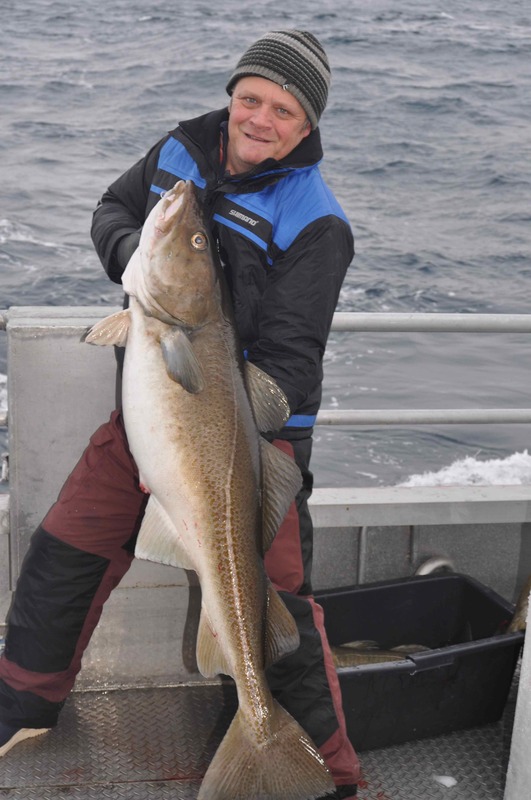 I and most of our group had fished extensively throughout the far north of Norway on many previous occasions, and we had caught what can only be described as some pretty large cod. On this trip, however, we knew that each and every time we watched a pirk gently flutter and flick its way down into the depths, lying deep in those frozen waters waiting to eat it there might be a cod so big that it would re-write the record books. The weather for the first five days of the trip was absolutely perfect. We enjoyed cloudless skies with not even the slightest breath of wind to ripple the glassy calm surface of the fjord, which was just as well as the air temperature was a face numbing, finger freezing -14°c! It was so cold that at times the rings on our rods became all but frozen solid with ice. It was so cold that in places the surface of the inner reaches of the fjord was covered in a layer of sea ice so thick we could walk on it, and through which we fished and caught cod. But we had expected extreme cold and were dressed accordingly, and the prospects of hooking a 100lb plus cod were more than enough to warm the coldest of fingers and toes! The evening we had arrived out host, Birger Matthiason, who in 2005 himself caught two 100lb+ cod here in his nets, had spent an hour pointing out the fishing hot spots on a chart. He had explained that as the water was so cold, too cold for spawning, most of the bigger fish were still hanging in the very deep water outside of the fjord. On Birger’s recommendation, the following morning we fished at a stubby headland at Skalsa, on the northern flank of the fjord. This mark was all of five minute run from the mooring pontoon outside our guest house, and within a few minutes of dropping our lures over the side we were admiring the first fish of the trip, codling up to about 5lb and a toothy wolf fish that made the fatal error of snapping at my 14oz stainless steel Norway pirk. Clearly there were large numbers of small codling in the fjord but on this trip we were planning on concentrating our efforts at hooking very big cod, and with this in mind our tackle had been tuned accordingly. Hooks on the pirks we were using had been upgraded to 10/0 and 12/0 trebles, which at first might look ridiculously large, that is until you see the size of the mouth on even a modest cod of 20lb. Big cod are easily capable of straightening smaller hooks, I’ve seen it happen on more than one occasion, while smaller hooks are also easier to rip free from a precarious hold in what really is a soft mouth. Split rings and swivels too, these were upgraded to the best available, while every effort was made in insuring reel clutches were correctly set and all knots perfectly tied. From experience I knew that softer 20-30lb class rods are more up to the task of successfully hooking and landing very big cod than a 30-50lb class, the stiffer action of the heavier rod will more than likely aid a big fish ripping itself free from the hooks. Within the first couple of hours on that first mornings fishing I hooked and landed the biggest cod of my life. We had spent an hour or two trying a few different marks, catching at most of them. Then Birger pulled up alongside us with the news that further into the fjord he had just seen a pod of whales feeding on herring. Find the herring, he explained with a knowing grin, and the cod will certainly be feeding too. A few minutes later we arrived at the spot, which we found easily enough thanks to a large flock of feeding sea birds and those whales. They were small, stubby, almost jet black whales that the Norwegians call ‘pig whales’, thanks to the grunting sounds they make when they surface and breath. Slowly I manoeuvred the 19ft aluminium boat into position so as not to spook the feeding melee, and a glance at the boats sounder confirmed we were indeed over a dense concentration of fish that extended from about 50ft beneath the surface right the way down to the bottom at almost 300ft. And sure enough, within seconds of dropping my pirk over the side the steady rhythmic thumping on my rod tip confirmed these were cod. For maybe half an hour it was a fish a drop, mostly 5-10 pounders with an odd specimen nudging 20lb. Clearly if there were big fish there it was going to be something of a lottery as to whether the lure was grabbed first by a five pounder or one of the better quality fish. From previous experience I knew that often the bigger cod tend to feed higher in the water column so after catching maybe a dozen fish I decided to concentrate on working my lure in midwater; and this is where I hooked my fish. At first I felt a delicate tap as the stainless steel lure fell through the water, and checking the flow of line from the spool with my thumb I stopped its decent and gently lifted the rod tip, which is when the fish struck. At first I thought it was just another run-of-the-mill double figure fish, and I started to gently pump it towards the surface, actually gaining line for a second or two. Then slowly but surely the rod bowed over, the tip getting dragged below the surface, as yard upon yard of line poured off the spool. For a while I was convinced I’d hooked a halibut, not an unusual event in Norway, but the run was slow and eventually the fish stopped diving and I could feel the rhythmic nodding that indicates a good cod shaking its head. For the better part of ten minutes I focused completely on successfully bringing it to the boat. When the fish put its head down I eased the clutch a little, returning it to the strike position when the run stopped allowing me to gently resume gaining some line. I cannot over emphasise the importance of maintaining a softly softly approach with these very big cod, if you try to bully and force them to the surface with an aggressive pumping action, you will lose far more than you land. Eventually we could see the first creamy white belly of the fish deep beneath the surface, and as it emerged clearly into view we could see it was indeed a very big cod. As it came closer to the surface I was convinced it would weigh better than 60lb, such was the size of the thing, but as it came closer still my heart went cold as I could see that just the thinnest slither of skin was connecting the hook on my pirk to the fishes bottom lip…and we didn’t have a gaff on board! The fish broke surface about 6ft away from the gunwale, and as I very carefully inched it towards the boat and tried to slip a free hand under a gill plate, my fingers now oblivious to the freezing water, the precarious hook hold finally gave way. I was left holding on to the fish with just one hand with frozen fingers, which were barely able to grip the slippery gill plate. I all but threw the rod into the boat and used my free hand to reach out, grasp the other gill, and drag the big fish over the side. Still I was convinced I had caught a 60lb cod but as much as I willed it on, the needle on the new certificated set of scales I had brought along the trip with me settled between 54lb and 55lb so I called it 54lb 8oz. To put things into their proper context this fish was barely half the size of what this very special place is capable of producing. A few years later I was once again back in Northern Norway, another attempt at encountering the fabled run of Skrei. 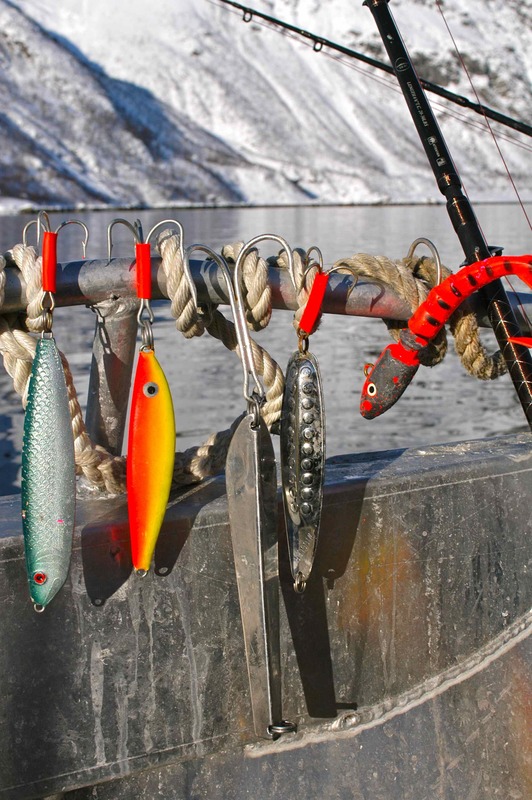 This time I was fishing out from another camp at Lauklines, a short drive from Tromso. We had arrived late in the evening the previous day, and were greeted with the encouraging sight on a 65lb cod that had been caught that day. The following morning my enthusiasm to go fishing was tempered when I woke up and could hear that just as forecast, overnight the wind had increased significantly. A brief glance beyond the cabin curtains into the world outside revealed a horizontal blizzard of snow was sweeping across the partially frozen fjord. After breakfast I climbed into my mountain of cold weather clothing, then crunched my way through a fresh fall of knee deep snow the short distance from my cabin to the boat dock. Conditions inside the fjord were not nearly as bad as I had expected, but as soon as we left the shelter of the fjord at Lauklines and headed offshore towards our destination some 20 miles out in the cold, grey, open North Atlantic, the boat had started to pitch and roll heavily at it met the increasingly confused seas we encountered, conditions that got progressively worse the further offshore we ventured. We managed to fish for half a day and caught a veritable mountain of cod. All were beautifully conditioned fish weighing up into the low thirty’s, but my midday half of our crew had succumbed to the inevitable sea sickness, and with sea conditions forecast to get even worse the decision had been made to call it a day. What had made matters worse was not only were the sea conditions rough, but the air temperature with combined wind chill was brutally cold. The choice facing those who were ill was either to shelter in the boats spacious cabin, which is just about the worse place to be if you are feeling sick on a rolling boat, or stand outside in the fresh air and risk the onset of hypothermia! So I wasn’t exactly bubbling with excitement at the prospects of going to sea again, but early the next morning our guide, Marcus Ahlund, came round with the sobering news we’d be sailing at 0700, adding that the skipper ‘thought’ conditions ‘might’ ease a little in the afternoon. Snuggled up beneath the warm cocoon of my duvet, in my warm room in my warm cabin, for some time now my mind had been running through the various excuses I might be able to use to get out of going fishing that morning, and it took something of a monumental effort to crawl out of bed, drink a couple of cups of coffee, get dressed into my cold weather gear and walk the 50 yards to the boat; still wondering if it was too late to fake serious illness! 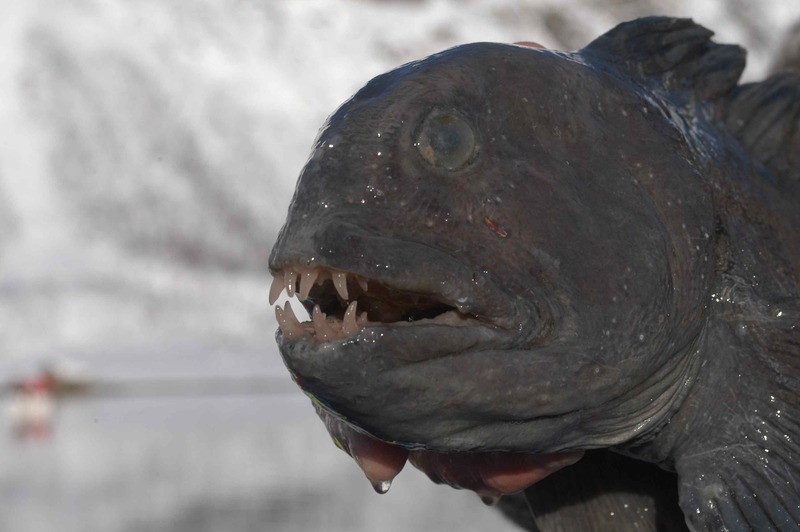 The famous run of outsize Barents Sea cod, the Skrei, that each year migrate from their rich feeding grounds off northern Russia to the coast of Norway to spawn had arrived. Over the years I have attempted to intercept ‘the run’ on several occasions, though never have I quite got it right. Now there was no disputing we were in the right place at the right time, with the right boat and probably the best skipper I have fished with in Arctic Norway. Better still, word on the snow encrusted dock that brutally cold morning from the few commercial skippers we spoke to was that this year not only were there more cod than ever, but the average size of these fish was big, very big. Several commercial boats fishing jigging machines, we were told, already had taken cod weighing more than 100lb! Several ‘uncomfortable’ hours later a sharp reduction in engine revs confirmed that once again we had arrived at the fishing grounds, a vast under sea plateau known as ‘Malang Grunden’. As our various lures dropped swiftly away in the clear water to the seabed some 200ft beneath, word from the wheelhouse confirmed that once again there were dense shoals of fish beneath us. Which indeed there were, as within minutes of starting to jig all five of us were bent into fish. My first cod that day wouldn’t have made 10lb, but the next drop the rod bent savagely and started to bounce to the tune of what clearly was a considerable fish. Bracing myself against the rails as the boat rolled heavily in the confused seas, slowly I worked my fish up towards the surface and when finally I got a glimpse of it all thoughts of struggling to fish in rough Arctic seas were instantly forgotten. As it came aboard over the gunwales it crashed onto the deck with a substantial thump, and tipped the scales at 45lb, now I was glad I gone fishing! During the first couple of hours fishing we caught a truly staggering amount of big cod. The fish averaged between 20-30lb, along with several others better than 40lb and our first 50 pounder of the trip. Then our skipper, ‘Cato Hansen’, hooked into what clearly was a much bigger fish, and when a man who has fished for cod off northern Norway all of his life as Cato has gets visibly excited about playing a fish, it’s time to sit back and watch what unfolds! Cato played that fish for ten minutes, and by the continual savage lunges on his rod we could see he had indeed hooked a monster, but when finally that fish came into view everyone aboard gasped out load; it was monstrous! It took two men working two gaffs to heave the great thing aboard, and even then they struggled, and when that fish hit the deck the entire boat shuddered. Clearly it was the biggest cod I had ever seen, and this was confirmed when the needle on the scales settled on 31kg; that fish weighed over 68lb!! 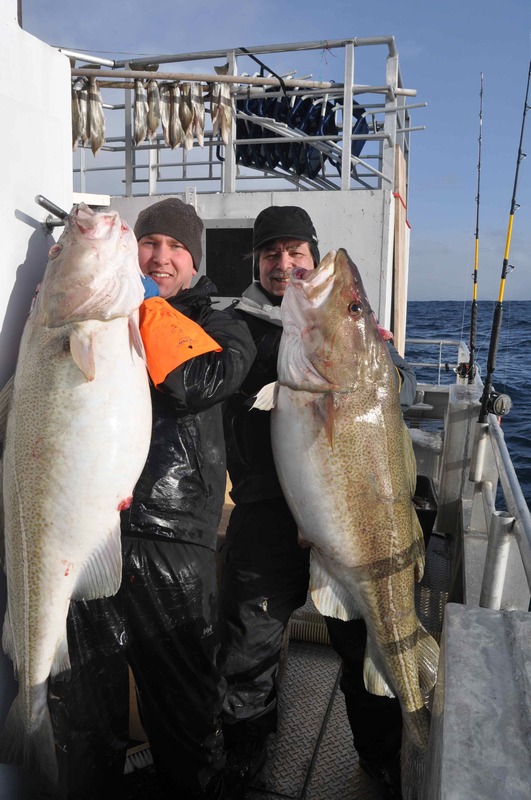 Even though the sea conditions were still bad, indeed for a time they got even worse, nobody had time to think about being cold or ill. We were in cod fishing heaven and we all knew that each drop could produce angling’s Holy Grail-a 100 pound cod on rod and line. In the early afternoon Cato announced that one of the commercial boats fishing the same area had just taken a fish of 55kg, which is an amazing 121lb! The fishing eased around lunchtime giving us chance to take stock of the morning, get our breath back, stretch aching limbs and generally reflect on a very special mornings fishing. Cato used the break to slowly cruise around the area looking for significant signs of fish on the boats sonar, before finally stopping over what clearly was a huge shoal of fish that the sounder showed extended from the seabed up fully 60ft in the water column. Again we started fishing and once again it was 20’s, 30’s, 40’s and occasional 50’s all round, and still it was the prospects of hooking something truly remarkable that kept us fishing in those finger numbing, face freezing, horribly rough arctic seas and finally, for one of us, the dream came true. 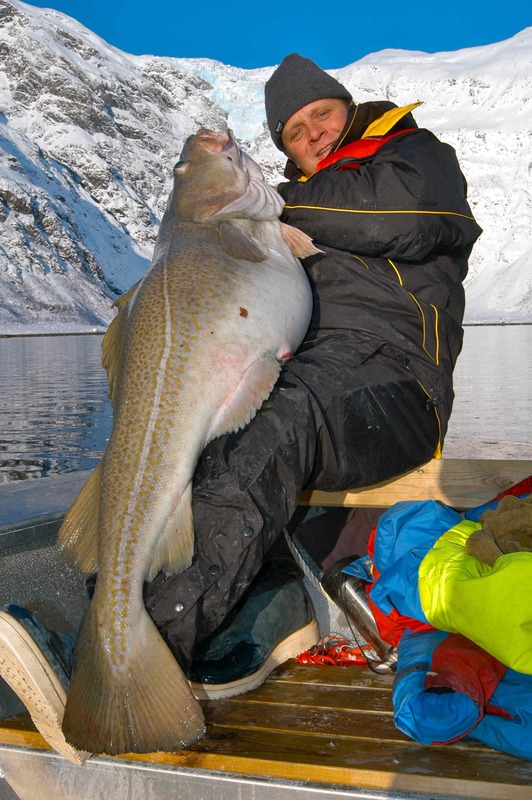 Kim Erik with his monster cod: 73lb 4oz! myself and three others are going in Earlly April and i cant wait. Ive been lucky. Ive been to some beautiful parts of the world. but what Norway has to offer surely cannot be beaten. We’re planning a trip to Norway for June/July. What area would you recommend for the best shore based cod fishing? Hello.2 of us would like to fish for cod,coal fish and halibut in June or July 2018.i am an experienced boat skipper but my friend suffers from sea sickness.Can you recommend somewhere in Northern Norway or Iceland which offers sheltered fjord fishing?